Who's On The Right Time? 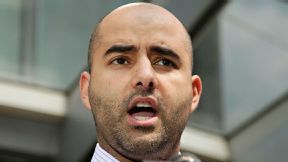 AP Photo/Carolyn Kaster The NFLPA's George Atallah will join Bomani. Bomani Jones hosts live from the Clevelander in Miami and welcomes NFLPA Executive Director of External Affairs George Atallah (4:30 p.m. ET), ESPN NFL analyst Damien Woody (5:30) and host of GymCastic, The Gymnastics Podcast Jessica O'Beirne (6:30) to the show. Tweet Bomani at twitter.com/bomani_jones -- while he's live with you from 4 p.m. to 7 p.m. ET on ESPN Radio and ESPNRadio.com.